Wilfrid Laurier University student Kim Arbour has a resume filled with highlights: an impressive grade point average, participation in intramural athletics and involvement in student clubs. However, the most recent bullet point Arbour added is the one the Kinesiology student is most proud of: an Undergraduate Student Research Award (USRA) from the Natural Sciences and Engineering Research Council of Canada (NSERC). NSERC is Canada’s federal funding agency for university-based research. The USRA program supports undergraduate student inquiry, providing individual students $4,500 in funding to help them develop skills and an interest in research. Arbour received NSERC funding for her research into how hand dominance affects how people complete simple tasks. NSERC encourages Indigenous students to apply for the Undergraduate Student Research Award. Arbour, who is Indigenous, says the award provided her with a “golden” learning opportunity. She received support from Laurier’s offices of Indigenous Initiatives and Research Services, as well as a research supervisor. Arbour admits she was initially nervous about applying for the award, but an email from Laurier’s Office of Indigenous Initiatives changed that. 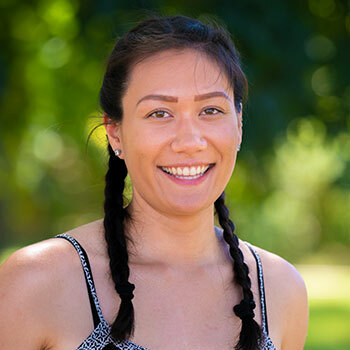 Arbour credits Melissa Ireland, Laurier’s manager of Indigenous student services, for helping her work through the application process and other logistics. She says Ireland and her staff at the Waterloo campus Indigenous Student Centre offered her community, an important factor in her decision to apply for funding. To start her research, Arbour would need to remain in Waterloo during the spring and summer months. With her roommates having returned home, she would be on her own for the first time. Students participating in the USRA program require a research supervisor. Arbour contacted Pam Bryden, a professor in Laurier’s Department of Kinesiology and Physical Education and a handedness expert. Conducting research is a big undertaking. Arbour was responsible for creating her research protocol, obtaining approval from the research ethics board and recruiting participants for her study. Arbour investigated how hand dominance affects how people complete a simple task, such as sharpening a pencil or opening a jar. Her research also examined the consistency of people’s ability to recall how they completed the task when compared to video footage Arbour reviewed afterwards. Arbour hopes her work can contribute to the development of a bimanual handedness questionnaire to assess hand preference in tasks that require both hands. Currently, only unimanual handedness assessment tools – which measure left- or right-hand dominance – are available. Bryden and Arbour are formatting Arbour’s research findings and paper to send to academic journals for publishing consideration. “That feels pretty cool,” says Arbour. Any Laurier student interested in applying to NSERC’s undergraduate student research award program should contact their department. Application deadlines vary. Indigenous students interested in applying should contact Emily Daniel, Indigenous student support coordinator, to begin the application process. The deadline to apply is March 18.